Join us for our FUN, FAMILY-FRIENDLY Tot Shabbat service, filled with singing, dancing, blessings, storytelling and musical instruments. Celebrate Shabbat with Amy Damast, ECEP Director, song leader Vivian Gibilisco, Rabbi Gershon, Cantor Shemesh and a dynamic group of families with young children! This monthly service is geared toward children ages birth to first grade and the adults who love them! Holiday Programming - Early Childhood High Holy Days Program - Geared toward ages 18 months to 4 years, the children will learn about the many customs and rituals associated with the High Holy Days, including Tashlikh, shofar blowing, reflecting on the past year and vowing to “do better.” The children will participate in art activities, sing and dance, explore classroom materials, enjoy holiday-related stores and, weather permitting, play in our backyard playground. The program will be facilitated by Dr. Amy Damast, director of the Early Childhood Education Program. This service takes place on the first day of Rosh haShanah and on Yom Kippur from 2:30-3:00pm. It is a family-friendly, fun, and interactive 30-minute service, with songs, prayers, and story. This service is perfect for children ages 8 and younger, their siblings, and parents. This service is open to the entire local community – no tickets are required. Temple Sinai provides opportunities for families to celebrate festivals together throughout the year. 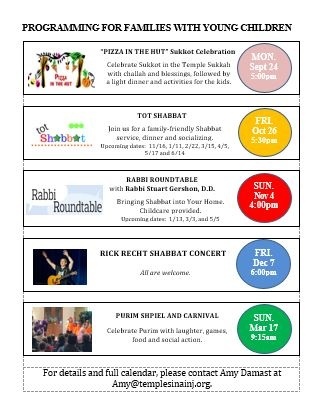 Your family might can enjoy time in the sukkah for our Pizza in Hut Sukkot celebration. You might want to dress up for Purim and join in the festivities at our outstanding Purim Carnival. Or you might choose to celebrate Shavuot planting flowers and singing in the Temple backyard. These celebrations change each year, and everyone is welcome! Social Action/Tikkun Olam - Our community of families with young children values opportunities for their children to participate in hands-on activities to make the world a better place. These activities have included working with GRACE’s Refrigerator to provide food for local food-insecure families, hauling mulch to beautify the Temple backyard, cooking and socializing with local homeless families who are visitors to our Temple through Family Promise’s Hospitality for the Homeless Program, and putting together bedtime bags for children who benefit from Project Night Night. Have ideas of other ways for young children to learn the joys of giving their time for others? Let us know! Rabbi Roundtable - Rabbi Gershon hosts 4 programs annually to support parents looking to incorporate Jewish values and rituals into their home lives. Topics might address including Shabbat celebrations in our busy lives, bringing Judaism to interfaith homes, and more.